First of all, no matter if it to better your life, business, health or your game, coaches are there to guide you, educate and inspire you in the field of their expertise and your desire to do better. There is always a team coach for any organized sport that you play or compete in. We have all grown up with knowing about these types of coaches. Many people today use fitness coaches in a gym, health coaches in improving your vitality, and the epic-thing now is life coaches. Most people think of a coach as a teacher, because they were teachers that volunteered and coached our extra curriculum activities. I am a mix of body, mind & soul coaching, which equals holistic. BUT I LOVE to inspire, motivate, educate and help a person transform and empower themselves in all aspects of their life. My back ground is business and holistic healing. As a professional educator I have the training to not only help you but teach you how to help yourself when I am not there and to increase the profits in your pocket. 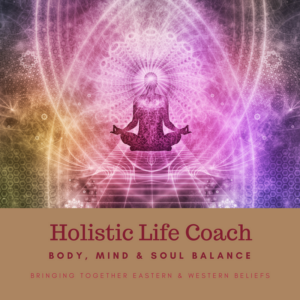 A Holistic Coach is someone who can pull out from their tool box many techniques from the modalities they have mastered, and use whichever is best for the client's well being. When you body, mind and soul is balanced there is health, wealth and happiness. It is with great pleasure to coach you!